The EZ-ZONE®PM panel mount controller offers control options that reduce system complexity and thermal loop ownership cost. It can be ordered as a PID controller, an over/under limit controller or its functions can be combined into an integrated controller. The EZ-ZONE PM Express panel mount controller is an industry-leading PID controller that allows optimal performance utilizing simple control and menu functionality without complex features. It is ideal for basic applications and usage levels. Limits are available in a broad range of packaging options, allowing selection of the best version for an application. The temperature limit controller Series LV is available with an operator interface and can be ordered in 1/8 DIN-square panel mount or DIN-rail mount design configurations. The SERIES LF limit controllers offers fixed set points and can be supplied with or without an operator interface. 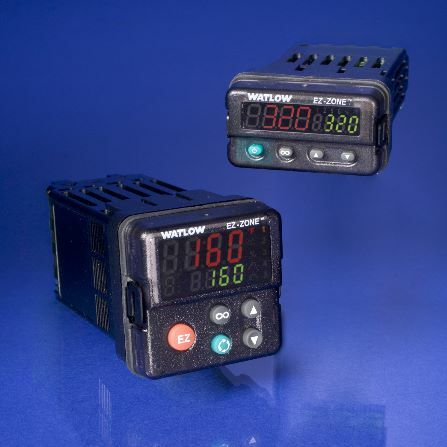 The Watlow TLM (thermal limit monitor) series is a compact, cost-effective thermal limit monitor solution for multi-channel, redundant temperature monitoring.